Everything you need to create your favorite classic Disney characters! It all started with a mouse! Learn to draw the most iconic characters in history in all their variations from the 1920s to now. 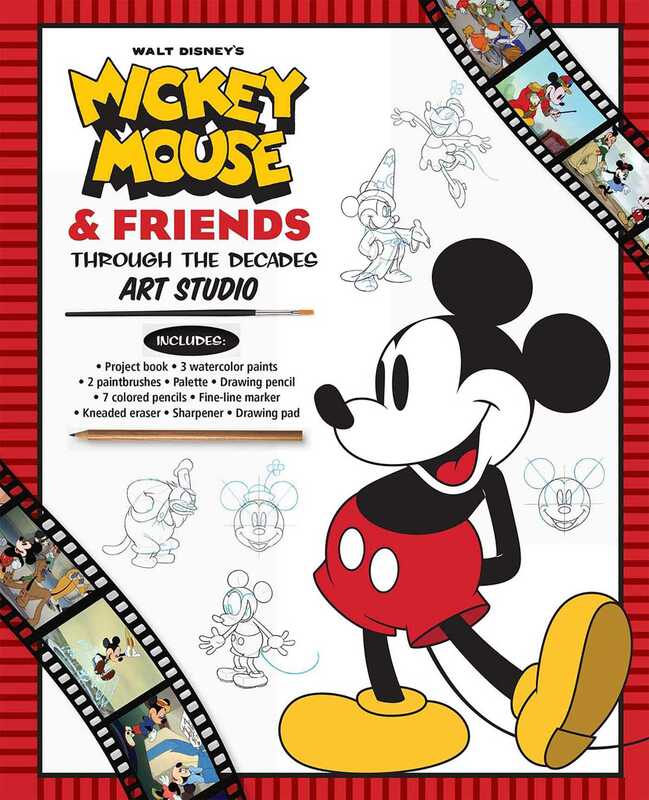 Mickey and Minnie Mouse, Donald and Daisy Duck, Goofy, Pluto, and even Pete from Steamboat Willie are ready to leap off the page with the art supplies included in this kit. Easy-to-follow instructions and a bit of art history will help you draw your favorite classic Disney characters just like the professionals. Included in the kit are 3 watercolor paints, 2 paintbrushes, a palette, a drawing pencil, 7 colored pencils, a fine-line marker, a kneaded eraser, a sharpener, and a 96-page project book to bring these characters to life! Greeting cards, party decorations, and lunchbox surprises are more fun when you make them yourself, and this Disney art studio kit will help you get started! David Gerstein is an animation and comics researcher, writer, and editor working extensively with the Walt Disney Company and its licensees. His published work includes Mickey and the Gang: Classic Stories in Verse (Gemstone, 2005); Walt Disney Treasures—Disney Comics: 75 Years of Innovation (Gemstone, 2006); The Floyd Gottfredson Library of Walt Disney’s Mickey Mouse (Fantagraphics, 2011-present); and Walt Disney Uncle Scrooge and Donald Duck: The Dona Rosa Library (Fantagraphics, 2014-present). Gerstein has also worked with Disney in efforts to locate lost Oswald the Lucky Rabbit cartoons and to preserve the Mickey Mouse newspaper comic strip. Outside of the professional world, Gerstein fears mice and considers ducks a fine dinner. The Disney Storybook Artists work from their offices in Anaheim, CA.